The aim of this conference is to expand on and question how art can contribute to understanding contemporary environmental issues and challenges. Artistic research practice has a unique capacity to offer crucial insights informing our understanding of environmental issues in the era of the Anthropocene. The reflexivity inherent in arts research along with emphasis on expressive communication as outcome offers significant scope for bringing crucial yet complex relationships between vulnerable species, human action and climate change to wider appreciation amongst general audiences and key stakeholders. Placing artistic interpretive methods alongside scientific interpretive methods carries some risks and challenges, particularly as artistic approaches may incite an open-ended, contemplative engagement with the scientific, sensorial and political layering of environment, that is not typical of mainstream science communication. Ways in which arts practice complements and extends scientific insight will be centrally addressed. Papers presented will critically address issues, challenges, strength and benefits of inter-disciplinary practices looking beyond the visual arts. The programme includes keynotes speakers, parallel sessions, portfolio viewings, a book signing event, networking opportunities, conference dinner and drinks reception. The detailed programme will be published soon. In a 2017 survey conducted across France, Germany, UK and Norway, climate change was not perceived by the public in any country as one of the most important problems facing their country. However, in a recent multi-national survey, climate-change denial was more frequent in Germany and the UK than in France and Norway. Denial is currently on the rise among both the populace and policy-makers in both the UK and USA. These statistics emphasise that outreach is as important as research in the field of climate change impacts. Camille will give a brief overview of the science of the impacts of climate change on natural systems and wild species, and discuss these findings in the light of public perception and negative messaging. She will give highlights of several non-traditional outreach activities she has been involved in that have helped bring opposing viewpoints to a common understanding. The arts community is well-placed to help translate research findings into formats that are more accessible to the public and policy-makers, and provide positive and actionable messages. Camille is a Professor in the School of Biological and Marine Sciences at the University of Plymouth (UK) where she holds the National Marine Aquarium Chair in Oceans and Public Health and an Adjunct Professor in the Department of Geological Sciences at the University of Texas at Austin (USA). She is just beginning a position at the CNRS station for Experimental and Theoretical Ecology (SETE, in Moulis, France) as a "Make Our Planet Great Again" Laureate. Her research focuses on the impacts of climate change on wild plants and animals and spans from field-based work on butterflies to synthetic analyses of global impacts on a broad range of species across terrestrial and marine biomes. She has also authored numerous assessments of impacts of climate change on agricultural pests and on human health, through changes in the wild animal vectors and reservoirs of diseases. Camille has received numerous scientific awards, including being ranked the second most highly cited author in the field of Climate Change from 1999-2009 (T Reuters), named the "2013 Distinguished Scientist" by the Texas Academy of Sciences, elected a Fellow of the Ecological Society of America, and newly-elected Fellow of the European Academy of Sciences. Her 2003 paper in Nature was ranked the most highly cited paper on Climate Change (Carbon Brief, 2015). She works actively with governmental agencies and NGOs to help develop conservation assessment and planning tools aimed at preserving biodiversity in the face of climate change. She was awarded the Conservation Achievement Award in Science by the National Wildlife Federation, named "Outstanding Woman Working on Climate Change," by IUCN, and named as a “Who’s Who of Women and the Environment” by the United Nations Environment Program (UNEP). She has worked with the Intergovernmental Panel on Climate Change for 20 years, and is an official Contributor to IPCC's Nobel Peace Prize in 2007. In this presentation Anne will discuss the development of a series of artworks concerned with species loss and the decline of the honey bee. Through a range of photographic methods, she has worked to develop new images and metaphors that assert a critical and imaginative frame through which to consider the fragility of the world’s natural biological systems and our part in their rapid transformation. Considering the observational practices of artists and scientists, she will also present some perspectives on the distinctive languages of art and science and her experiences of the potential of transdisciplinary research to generate new ways of engaging audiences and communities with the outcomes of innovative art/science collaboration. Anne is Distinguished Professor of Fine Arts (Photography) at Massey University, Wellington, and a New Zealand Arts Laureate. Her recent projects engage with contemporary environmental issues and result in installations that incorporate still and moving images and sound. She often works with and alongside scientists on environmental projects that reflect on the ethics and politics of our relationship to natural systems and the places we inhabit. She is a New Zealand Arts Laureate, awarded in recognition of her contribution to the visual arts in New Zealand and is the recipient of US National Science Foundation Polar Medal. The onset of climate change is visible on an unprecedented scale in the high and sub-Arctic. The work on mediating climate change requires interdisciplinary collaborations. Already Alexander von Humboldt argued for the values of merging arts and sciences in the visualisation of knowledge and communicating experiences of observing the world. Glaciers, vanishing ice and changing landscapes is a recurrent theme in a wide range of attempts of mediating climate change seeking to expand ’usual’ research communication channels. Our collaboration is related to environmental issues and particularly climate change impact on the Arctic, most lately we worked on the project Arctic climate and environment 1880-1980. The project made several thousand historical photographs publicly available and created a volume of Swedish polar photography in the database Alvin at Uppsala University library (see The Polar Project - the digitisation of old images from the polar regions) and resulted in the publication Frusna Ögonblick – Svensk polarfotografi 1861-1980. A cross-disciplinary research network merges arts, humanities and science with museums, archives and libraries to seek to extend ways of mediating the complexity of climate change put in a wider environmental perspective. The Arctic landscape is a complex mix of coldness and beauty, threat and vulnerability. Experiencing it changing to the effects of global warming is emotional as well as terrifying and remarkable. To communicate that experience is an important challenge to be able to initiate public concerns and awareness. We have observed and documented change in the north for extended period of time. We know from experience in our own work and from historical comparative studies that the northern regions associated with arctic and alpine climates enabling ice and cold on a year-round basis is changing rapidly and therefore would like to create an extensive visual documentation and mediation of several northern focus sites to function as a record and living visual archive for future comparisons and an interdisciplinary communications platform. We would like to present some aspects of interdisciplinary collaborations between arts and sciences working on the changing landscapes of the north. Tyrone Martinsson is Professor of Photography at Academy Valand, University of Gothenburg. He works with Environmental photography and its applications within the global challenges connected to climate change, environmental issues and human/environment relationships. He has performed research on the Arctic using re-photographic methods for cross-disciplinary studies that address contemporary and historical descriptions of the landscape in Arctic Svalbard and how our view of nature and landscape changes over time. In 2003 he was awarded a PhD at the University of Westminster in London for his dissertation entitled Photographic Archaeology and Nils Strindberg’s Photographs from the Andrée Polar Expedition 1896-1897, that made visible how photo archives and collections can be brought to life using photographs as documents and artistic representations. His work in the Arctic titled Rephotography: a dialogue with history in an Arctic landscape, has been funded by the Swedish Research Council with support from the Swedish Polar Secretariat and the Norwegian Polar Institute. His recent publications include Expedition Svalbard – lost views on the shorelines of economy, with co-editors Gunilla Knape and Hans Hedberg (Steidl Verlag) and Arctic Views: Past and Present (Art &Theory Publishing). He co-edited another publication based on a cross-disciplinary research photography project, Arctic climate and environment 1880-1980, with Per Holmlund, Stockholm University. He is currently pursuing research on Arctic glaciers and their history where stories of ice are generated through photography and visual histories. Dr Yan Wang Preston will present her two award-winning projects, Mother River and Forest. For Mother River (2010-14), Preston spent four years photographing the entire 6,211km Yangtze River in China at precise 100km intervals. Designed to provide an antithesis of the mythic image of Yangtze as China’s Mother River, the project also became a systematic observation of China’s regional changes in geology, geography and urbanisation. For Forest (2010-17), Preston spent eight years investigating the politics of reforestation and ecology recovery in new Chinese cities. 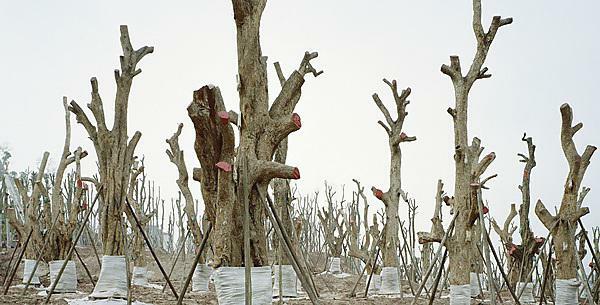 In Chongqing, a mega city with 30 million people, she photographed the adaptation journeys of transplanted old trees. In Haidong, a small and entirely designed ecology model town, Preston documents the other-worldly landscape of ecology recovery with their vivid, yet alarming colours. With a personal voice and sustained journeys of observation in space and time, Preston asks questions on how the city can be a homeland while reflecting on the artist’s role in the international debate towards landscape and the environment. Conference presenter and special book signing of the two monographs 'Forest' and 'Mother River', Thursday 25 April. Dr Yan Wang Preston is a British-Chinese artist interested in the contested states of nature in contemporary societies and how photography can be used as a tool to investigate hidden complexities of a given landscape. Her major projects include Mother River (2010-14) and Forest (2010-17). Preston’s work has won major international awards such as the 1st Prize, Syngenta Photography Award (2017), the Shiseido Photographer Prize at the Three Shadows Photography Annual Award in Beijing, China (2016) and the Reviewers Choice Award at FORMAT, Derby (2014). She has been nominated for Prix Pictet and Deutsche Börse awards many times. Solo exhibitions of Preston’s work has been shown at venues such as the Side Gallery, Newcastle (2019), Sharjah International Photography Festival (2018), Gallery of Photography Ireland (2017), Impressions Gallery (2017), the 56th Venice Biennale (2015) and Chongqing China Three Gorges Museum (2015). Important group shows include Our Happy Life at Canadian Centre for Photography (2019), Syngenta Photography Award exhibition at the Somerset House, London (2017) and Dubai Photo (2016). Preston’s monographs Forest and Mother River are both published by Hatje Cantz in 2018. Her work has been featured on numerous media channels such as CCTV, BBC, the Guardian, Irish Times, Chinese Photography and European Photography. She received a PhD in Photography at the University of Plymouth and is currently a part-time lecturer at the University of Huddersfield.